Six years ago this weekend these two incredibly young and naive people got married. They had NO IDEA what life would be like. Already they've been through more things that some have believed is possible in a mere six years. I suppose we should have suspected that life might be a bit crazy at times. And unpredictable. After all, that's how it all got started. I thought I'd share how our relationship progressed through use of particular songs which carry certain messages which make the point very well. In order to properly appreciate this post, you've got to listen to the songs or else you'll just be terribly confused. #1 - "You're so annoying. You might be one of the most annoying people I have ever met in my entire life. I wouldn't mind if you went away somewhere." Funny. You think they'd make songs like that. But they don't seem to cover that particular emotion in a reasonable way. That, folks, is how it all began. Dodging each other and/or tolerating each other in the company of mutual friends. What *I* didn't know was that Jonathan was a perfectionist and that dancing wasn't just something you did just for fun and entertainment purposes. Oh no! You did it for academics and skill! (Which is fun for him.) So while dancing was fun, and it was kinda enjoyable spending time with Jonathan, we suffered many disagreements about HOW one should dance and in what spirit one should dance for the next TWO YEARS of dance classes. I found my feelings for him were kinda...wobbling. We had a good time together but we had to work so hard to make sure our feet were in the right position (we made a serious study of dancing if you were wondering!) that some days I liked him more than others. We officially "dated" for two weeks. Then we got engaged. #5 - Then we got married! (And no, the story doesn't go downhill from here. It just got REAL. And if you're married - you know of what I speak!) I had this song sung as I walked down the aisle and it pretty much summed up how we wanted to dedicated our relationship to the Lord. And we're grateful for each and every day. I love you, Jonathan! I'm so grateful that I get to walk through life with you - whatever it looks like and whatever happens. You are the most amazing man I've EVER known and could ever hope to know! I wouldn't trade anything. Not a thing. Here's to another sixty years of ...all of this! Wow, what a story! Congratulations, Carrie and Jonathan! Loved your tale. Thanks for sharing. Happy anniversary! Great story. It sounds like... life. I would never have thought of having that song for a processional, but how PERFECT. I love that you included a picture!!! :) So sweet!! Happy Anniversary! My husband (also named Jonathan) and I celebrated 6 years last week. :) We only dated 11 months, though. Your #7 sums it up perfectly!! Congratulations and happy anniversary! 6 years!!! We're celebrating a certain someone's 7th birthday around here this weekend. Time flies when you're having fun, right? I hope you guys get to do something fun sans children this weekend! God bless you both! Great post Carrie! And, yes! I did listen to every song! :) Congrats and happy anniversary to you both! Happy Anniversary to you and your hubby! Love that song "Another Day in Paradise"--it sums up all the craziness and the love in marriage and family! Having been with you (in spirit and email mostly) through these times I particularly loved the songs you chose. May your years ahead be only more lovely then those behind and may your adventures only serve to make you grow stronger together, may your laughter grow sweeter and your tears be few. Loved reading this story, enriched by the songs. Made me smile! Our 6th anniversary is in July. 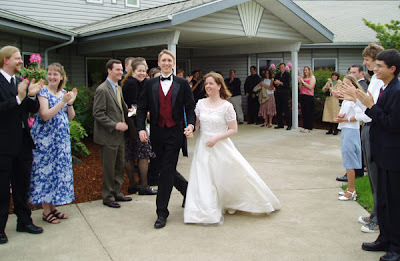 Not sure if I've shared the story of how we met on my blog--I should check on that. I didn't realize you and Jonathan had lost two parents to cancer. I'm so sorry to hear that. You definitely have been through a lot in 6 years of marriage. Grateful for God's faithfulness to you! What a dear, sweet story of God's grace throughout your life together. Thanks so much for sharing--and happy anniversary! Happy anniversary! What a great story! 2 years of dance classes... that is kinda funny! We have #6 coming up this summer and if I remember correctly it would have been just last weekend (6 years ago) that we officially announced to our graduating class that we were engaged! We only knew each other 13 months and dated for 9 before the wedding day. Ridiculously crazy! I remember that moment in that photograph so well. Who could have foreseen the amazing ups and horrific downs of life you'd experience in the six years after that. But the refining fire has turned the both of you into something sharp and brilliant...and we can't wait to see what's next. Oh what a sweet post! I loved reading your story and how an inauspicious beginning led to the wonderful family the two of you have created. Happy Anniversary!! How amazing. I'm so glad you posted this! Happy Anniversary! It's so good to know y'alls story--I know you as a mom and knew you in Texas (and on the way to move away from it!) but this was a bit of a blurry spot until now! I love it!! I loved how you told your story - not through rose-colored-glasses, but with your feet firmly on the ground. May your have many many more years together building memories (and songs! ).